Visit THEMES TO EXPLORE for our program adventure highlights for 2019 and access FREE ACTIVITY SHEET DOWNLOADS. 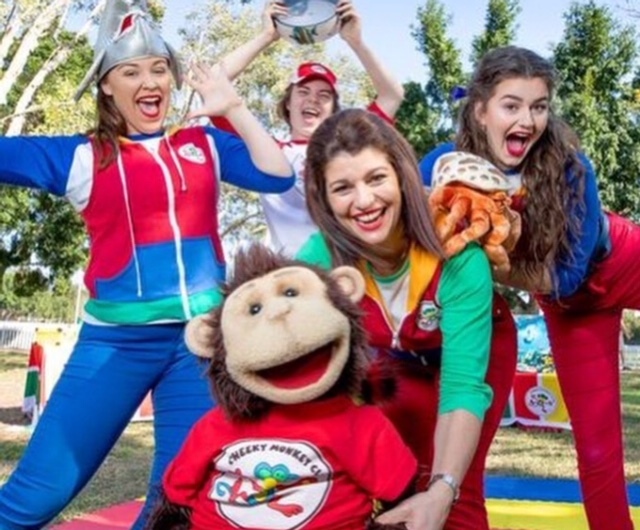 40 minute Interactive Musical Adventure Sessions & Shows for children aged 2 - 6 years available for Early Learning Centres & PREP Incursions. Build confident and happy children. 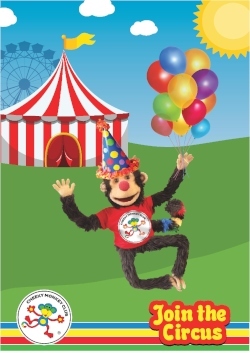 Contact us to receive more information about what Cheeky Monkey Club can do for you and your Cheeky Monkeys. Where the fun never stops! We are always creating and writing new shows, so contact us if you have a specific theme in mind. Just leave it up to us and our imagination! Take a look at our YouTube channel to hear our original tunes and enjoy our Interactive fun learning content. 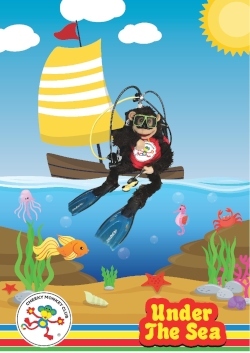 Everyone loves to go deep sea diving and explore what lies beneath the sea. Join in this colourful adventure, as we all row the boat out to sea and watch whales dancing on the waves. Listen to the hypnotic sound of the ocean drum and be careful not to get wet! Hide with the crabs, swim with the dolphins and play with the shells. Cockadoodledoo! The rooster says, it's time to "Wake up!" We need to milk the cows, shear the sheep, collect the eggs and harvest the crops. Uh oh, there are birds that need shooing from the garden. It's so much fun being a scarecrow. 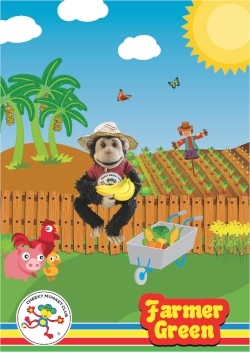 Meet Cheeky Monkey's pet worm, living in a worm farm and learn what she loves to eat. Everyone needs to help Farmer Green down on the farm. There's lots to do! 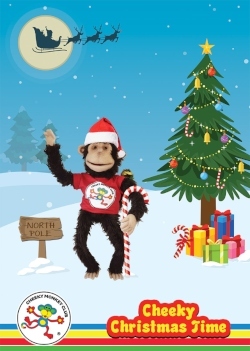 Every Christmas, Cheeky Monkey finds himself needing help from the Banana Bunchees and his friends to either solve a mystery or guide him to making good choices. You never know who will join in the festive fun; Rudolph, Snowflake the Snow Angel, Goldie the Elf, Delivery Dan or Frosty Fox? Certainly a favourite time of year for all Cheeky Monkey Club fans as we sing and dance, while celebrating the magic of Christmas. 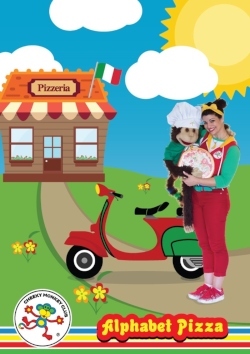 Cheeky Monkey is very excited about a visit from Giuseppe, the world famous Italian pizza chef. Upon arrival, we discover that Giuseppe can't read and needs to practice his ABC's. Cheeky Monkey and his friends have fun teaching Giuseppe to read the pizza recipe while creating a delicious alphabet pizza. Sing in Italian, dance the Tarantella and laugh out loud as we all help Giuseppe on this endearing adventure. Bravo! Cheeky Monkey and his sister Chiquita love the colours of a rainbow and are hunting for them everywhere! Exploring all the different seasons of the year, they discover where rainbows love to hide. Along the way, meet Igsy Bigsy Spider hiding under the Autumn leaves and Coral the Frog who sings a sweet tune after a storm. Sing, dance, sort and solve during this Interactive Musical Adventure. Oh no! Someone has stolen Cheeky Monkey's treasure. It's time to go on a treasure hunt and look for the Letter X. Everyone will need to help row the boat, balance on the plank and follow the clues on the map. 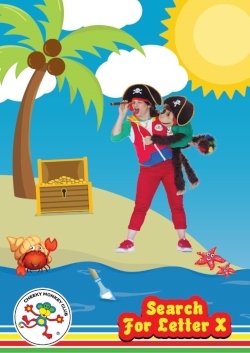 It's going to be so much fun being a pirate and very exciting discovering all the treasure. Watch out for the crocodiles and keep your eye out for anyone stealing treasure! 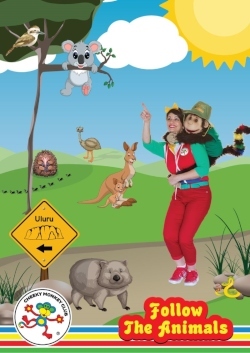 Cheeky Monkey and the Banana Bunchees are on an Australian Outback adventure to Uluru. Not quite sure which way to go, they meet Rodger the Ranger riding Emily Emu offering a helping hand. While singing and dancing their way towards the big red rock, they find themselves lost and in a storm. 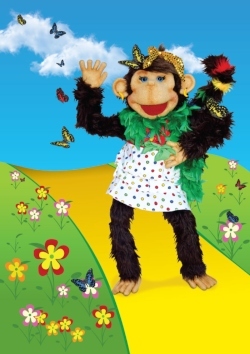 Cheeky Monkey and the Banana Bunchees will need everyone's help to get them back on the right track. Cooee! Ladies and Gentlemen, boys and girls, introducing the cheekiest monkey around. Juggle with the clowns, balance on the tightrope, spin the hoops and perform the magic disappearing scarf act. Did you hear that silly sound? Ta dah! With Easter around the corner, Cheeky Monkey discovers that Lucky Clucky is not having any success laying coloured eggs for the Easter Rabbit. She is rather frazzled and needs some help remembering how to lay different coloured eggs and not just plain white ones. Cheeky Monkey and his friends investigate the problem and with a magical call to the Easter bunny things get hopping along splendidly.